Which? has compared the carbon dioxide created by charging electric cars with that emitted by the most efficient diesel models and found that sometimes there's not a great deal of difference. The common manufacturer claim that electric cars produce 'zero emissions' ignores the fact that most drivers use a conventional electricity supply to charge them, which has a carbon cost from burning fossil fuels. 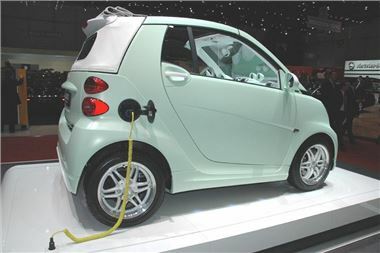 The consumer champion found, for example, that the electric Smart Fortwo* creates an equivalent of 84 grams of CO2** per kilometre driven, whereas the diesel Smart Fortwo emits 103 grams. However, electric cars are much greener than diesel cars when it comes to localised emissions, as they don't emit toxic chemicals that degrade air quality. This is especially significant in cities, where the uptake of electric cars is predicted to be highest. Richard Headland, editor, Which? Car, says: "We applaud carmakers' efforts to create greener cars - but we don't agree with their 'zero emissions' claims. Until more electricity is produced from renewable sources in the UK, the carbon footprint of driving an electric car may not be as small as owners think." *Which? looked at three of the first electric cars destined to hit the UK market and put them up against three efficient conventional rivals (mainly diesel-fuelled Best Buys). **The carbon dioxide created by charging the car. The Carbon Trust states that 544grams of CO2 are emitted per kilowatt hour of electricity used. Which? converted this to an equivalent grams per kilometre CO2 rating, to make it easier to compare with the diesel cars. Well from i understand e cars will be paying £310 tax a year anyway 3 years after you buy one starting in 2017 ,they will probably loose the free this and free that status because of the governments looses on tax revenues on fuel /road tax and VAT then you have the loss of revenue from the emnissions laws/regulations eg congestion charges emissions charges ect ,the bigger the take up of EV,s the bigger the losses to the government i dont think anyone has calculated the loss of revenue on emissions sensors and emission equipment ,the loss on fuel sales alone is getting bigger every year Yes we do need clean transport but it comes at a cost to someone and some of the losses will have to be replaced looking at the new VED charges vehicles the road tax is going to be appx £450 or £310 for zero emissions quiet what that means im not sure after the 3 years are up if you are going to buy a petrol /diesel vehicle you can expect too see any and all transport charges related to vehicles going up even if you drive biological lead free and non violent vehicles !